Updated Apple User Group Locator Festive Celebrations — Available Again! The Apple User Group Advisory Board and User Group Support Team have implemented a new support system to assist Apple User Group leaders worldwide. Every leader request for support is now assigned a unique ticket number which can be used to track the progress of the request online. The online support system will allow the AUGAB to better serve group leaders and get them the answers they need for their user group. The User Group Support Team is ready to help you out. 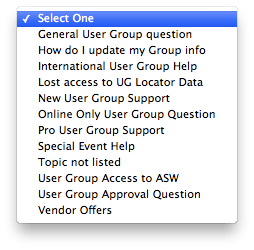 So if you are a Leader of an Apple User Group and you have questions, visit the The Apple User Group Support Resource Center.